Monday afternoon, during the House debate over the debt ceiling agreement, protesters interrupted the House session by chanting "Hey, Boehner, get a clue, it's about revenue" and "Boehner, get off it, it's time to tax corporate profits." 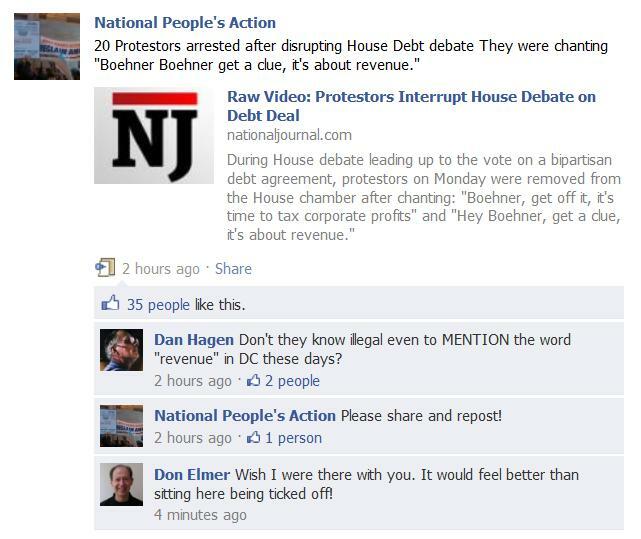 The name of the group taking credit for this disruption is called "National People's Action." 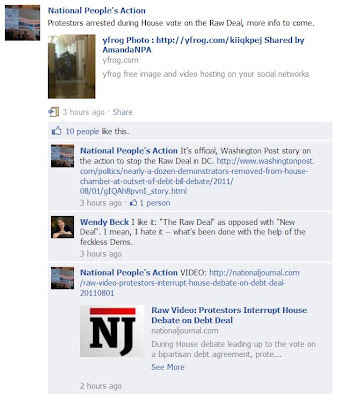 Below are two screen shots of their facebook page where they posted (bragged) about their disruptive actions today in the House. WHO IS NATIONAL PEOPLE'S ACTION? National People's Action (NPA) is a Network of community power organizations from across the country that work to advance a national economic and racial justice agenda. NPA has over 200 organizers working to unite everyday people in cities, towns, and rural communities throughout the United States. Showdown in America is a national campaign to keep families in their homes, hold banks accountable and fix the broken financial system. The wide-spread and harmful effects of foreclosures on families and communities must be stopped. The declining economy and the broken financial system will not be fixed until the foreclosure crisis ends. Ending the foreclosure crisis will stabilize home prices and stabilize the economy while building momentum for intelligent regulation of the financial industry. Smart regulatory reforms are necessary to ensure transparency, accountability and equality in the financial industry’s lending and investment practices. The campaign calls for critical solutions to address the foreclosure crisis and for sound and sustainable homeownership practices and policies to build an economy that works for the American people. We are leading this effort with more than 40 community organizations to fight corporate greed and the destruction of our communities. I looked on YouTube for the NPA Channel, but failed to find one. Instead, their videos are uploaded onto the ShowdownInAmerica Channel. There, you'll find 43 videos chronicling the "accomplishments" of several community organizing groups with which the NPA associates. I'll include a few of those videos below. This is ONE group out of many activists organizations in America that believe in shutting down private businesses with their activist techniques. In the video below, the NPA shuts down a Bank of America branch. Today's interruption of the House proceedings was not the first visit by the NPA to House Speaker John Boehner (R-OH). 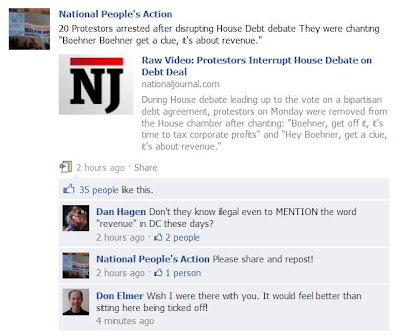 This video, posted on YouTube on March 7, 2011, shows the NPA chanting more of that inane "this is what democracy looks like" chant outside the Speaker's D.C. office as well as outside the office of Senator Mitch McConnell (D-KY). I couldn't resist including this video in the mix. It shows that the NPA is more than willing to sacrifice any and all dignity that they may have in order to accomplish...what? I'm not sure. See for yourself. These are all groups that seek to advance the cause for the "collective" and institute "social justice" in America. These are groups that believe you have a RIGHT to a job in America. They believe that you have a RIGHT to own a home in America, among other things. They believe that everyone in the world should have all of the same STUFF. These are groups that do not understand the concept of being born equal...but NOT dying that way. They seek to take what someone else has EARNED and use it for their own (which is also known as THEFT). Is it plain, old-fashioned jealousy or is it something more sinister that drives their agenda? You decide for yourself. I'd also like to let these socialist, radical community organizing groups and many union members know that the United States of America is a REPUBLIC, NOT a democracy! All you have to do is Google "The United States of America is a republic" and you will get about 416,000,000 results as proof of this fact. I offer the video below for these socialist radicals that are too lazy to leave this site and do some investigating of their own. The USA is a REPUBLIC!!! If that doesn't convince you socialist, union and community organizing-types, try reciting the Pledge of Allegiance..."republic" is in the second line. If that STILL isn't enough check out all of these direct quotes from our Founding Fathers about their thoughts on the creation of a democracy. This is from Wallbuilders.com. Reading the remainder of that page from Wallbuilders should clear things up even more for those radical, socialist, union and community organizing-types who still have doubts that the United States of America is a REPUBLIC. It is through the misunderstanding and just sheer ignorance that the socialist, community-organizing, union-reliant, social-justice-seeking group NPA exists in the first place. I find it ironic that a group like the NPA, which doesn't even possess even a remedial understanding of the form of government that exists in the USA, winds up INSIDE one of our branches of government to protest anything. How can they protest that which they do not understand?